Resort World SENTOSA just announced that it will be expanding the resort with a 4.5 billion dollar expansion. 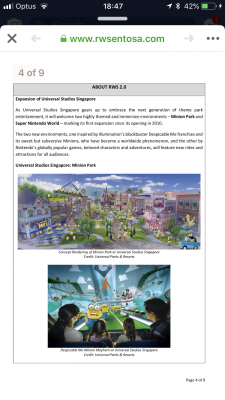 Most importantly USS will be expanding in size to include A minion park feature Discpicable Me Minion Mayhem, and a Super Nintendo World. A Super Nintendo World expansion is a logical choice for USS. But it is a shame that all of this expansion will have to come at the cost of "byebye!" to FarFar Away and the Waterworld Stunt Show Area, -given the Park has literally no wiggle room to look anywhere else. 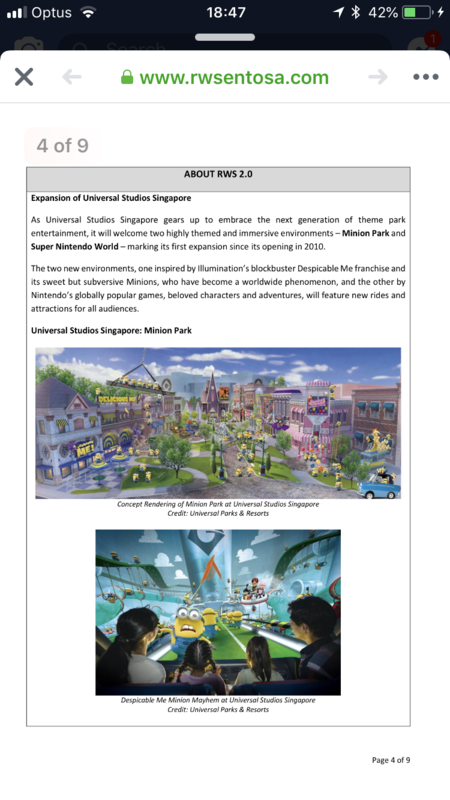 So the press release indicates that Minions will replace Madagascar, nothing on where NIntendo Land will go though. There is an expansion pad on the New York street but that doesn't seem big enough, can only assume they will sacrifice Waterworld and possibly part of the Jurassic area (maybe Canopy Flyer and the spinner?). I'm actually going to be in Japan in 2020 in time for the USJ Mario Land opening. 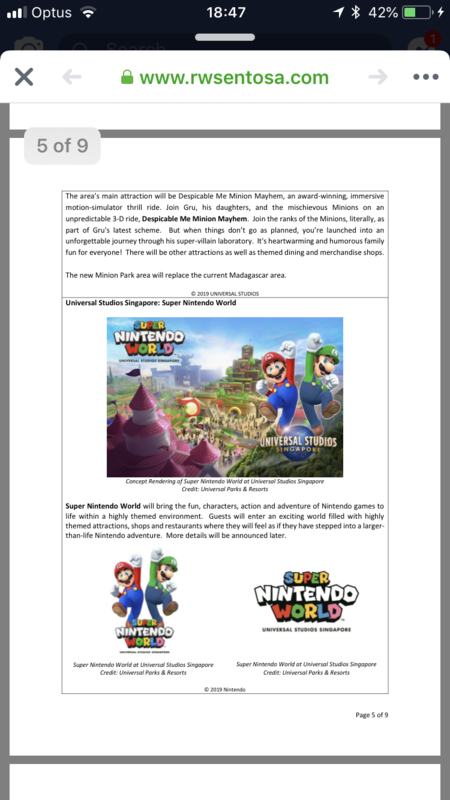 Can't wait for Super Nintendo World to be a thing in USG too. Having one at the nearest Universal park to our shores is exciting. The Minion area - not so much. Minion Mayhem is IMO the weakest Universal simulator, but great for the kids, Madagascar will need an update in the 2020s anyway as it will be an outdated IP very soon. Shame to see the Madagascar boat ride go though - I thought that was a nicely themed ride when I went there a few years ago. 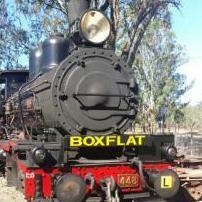 Something Dreamworld could replicate if it had the budget. Madagascar was always gonna be the first to go. The ride was plagued with problems and takes up so much space. Plus their is more land behind the main show building for expansion. However I don’t see Far Far away leaving anytime soon. The castle has become an icon for the park. I’ve been to the park multiple times, and Madagascar is definitely the weakest area of the park, the attractions are poor and doesn’t add anything to the park. Minions are so popular in the shops throughout the park, so look forward to seeing that come to life. I can see the Nintendo Land replacing Water World as that area of the park is quite expansive. The show was already beginning to loose elements such as the iconic plane scene when I was there late last year. Quite impressive that they fit that park and the back of house into that space. Also impressive is that all available roof space has greenery or solar panels on top. The plane scene is gone?? ?